Enhance your school's ceremonies with orange graduation stoles from Honors Graduation! 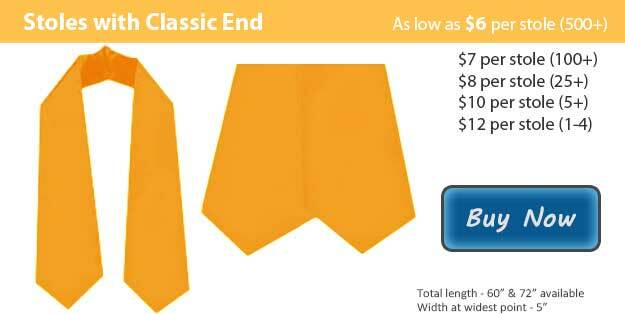 Made from premium quality crepe back satin, and at affordable low prices, our honor stoles will be sure to complete your institution's dignified commencement attire. You will be sure to appreciate the savings even more when you take advantage of our fantastic bulk discount deal! Several reasons exist for choosing to use graduation stoles during your school's commencement. They can reflect participation in certain clubs, organizations, sports, or leadership positions. You may also choose to use them to signify high academic honors, particularly if used in conjunction with honor cords. Another classic option is to use it as a "stole of gratitude." In this graduation tradition, students wear their honor stoles throughout the ceremonies and celebrations. Afterwards, each graduate finds a mentor who has been instrumental in their achievements, and presents him or her with the honor stole as a token of gratitude. Each of these purposes serves to deepen the memorable nature of graduation, and you can be rest assured that your orange honor stoles from Honors Graduation will be perfect in any of these commencement capacities. You may also choose the color orange for one or more of its symbolic meanings. Orange is associated with enthusiasm, happiness, determination, success, and encouragement. Any one of these attributes are perfect when considering what exactly is being celebrated throughout any graduation: the enthusiasm and happiness as students celebrate their achievements, the determination it took to participate in the ceremonies, the successes they are observing, or the encouragement from surrounding friends and families. Additionally, when presenting degrees in higher institutions, the color orange represents engineering or civil engineering. Place your order for orange honor stoles today, and remember to look into our other graduation products, including gowns and honor cords!